Water is the only common substance on the earth that appears in all three of its natural states within the normal range of its climatic conditions, sometimes at the same time. The three states include liquid, solid, and gas or — water, ice, and water vapor. Most liquids contract steadily as they freeze. Water, however, contracts only a certain amount, but begins to expand as it reaches its freezing point of 0°C (32°F). This expansion can fracture rocks. An unusual characteristic of water is its heat capacity, that is, its ability to absorb heat without becoming extremely hot itself. Think of a swimming pool on a hot day— does the water ever get as hot as the air temperature? Water has a high surface tension, that is, the ability of a substance to stick to itself. Certain light items can float on water and small insects can walk on water. It is estimated that it would take a force of 210,000 pounds to pull apart a column of water 1 inch in diameter. Water has a tremendous ability to stick to surfaces; this is called adhesion. In a very narrow column such as a plant root or stem, the combination of surface tension and adhesion pulls water upward. This movement is known as capillarity. A remarkable property of water is its ability, given enough time, to erode or, wear away, the hardest of rocks. Of the world’s total freshwater supply, over two-thirds is found underground. About 82% of our blood is water. 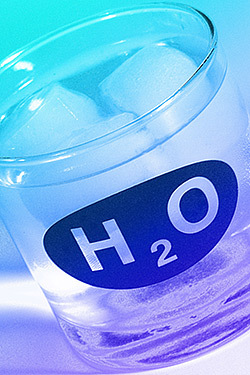 Water helps digest our food, take in oxygen, transport body wastes, and control body temperature. Only 3% of the water found on the earth is freshwater; 97% is salt water, found in the oceans and salty lakes. Only 1% of the earth’s water supply is in a form that is usable by animals, plants, and humans. Water data are often measured in millions of gallons per day (mgd). A million gallons is roughly equal to 20,000 full bathtubs.